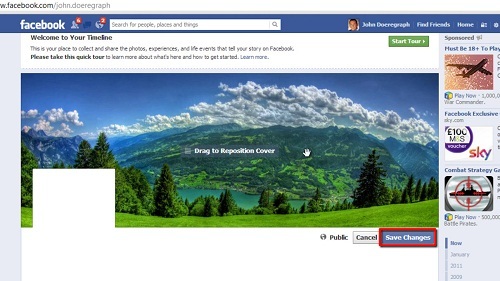 In this tutorial, you will learn how to add Facebook cover page. First, be sure you are logged into your Facebook account at “www.facebook.com” and navigate to your timeline by clicking on your name in the right-hand portion of the blue Facebook ribbon on the top of your screen. To the right of your profile photo, towards the other side of the screen, click on the “Add a Cover” button (if you already have a cover photo, it will say “Change Cover”). 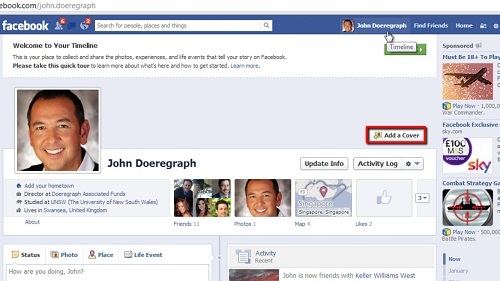 In the drop-down box, choose the place where the photo is that you would like to use – you may choose from your existing Facebook photos, or upload a new photo from your computer. Here we are using one of our existing Facebook photos. Once you have chosen your photo, you may drag it to reposition it where you would like, then click “Save Changes.” And that’s it, you now know how to add Facebook cover page.